The Profile in Excellence award is given by the OBU Alumni Association to a former student who has "demonstrated recognizable accomplishment in his or her profession, business, avocation, or life service in such a way as to bring pride and honor to the University." Each year, Profile In Excellence recipients are featured in OBU Magazine. David Dennis needed a second chance. In January 1975, Dennis stood in the registrar's office at OBU wearing blue jean overalls with a long ponytail trailing down his back. After making poor choices as a teenager and squandering a couple years at a state college, Dennis explained to the office assistant that, despite his cumulative 1.4 GPA, he should be admitted to OBU. He shared how he had recently made a commitment to Christ and explained how he felt God was calling him to attend there. Fully aware of OBU's admissions standards, the assistant graciously told Dennis he would not qualify. Dennis kindly asked to speak to the university president. David Dennis (back row, second from left), a 1979 OBU alum, stands with his family, including (back from left) Dryden, Dalton, Becky, Dillon, (front from left) Daxon and Dabney. Dennis will receive the 2011 Profile in Excellence Award at OBU's Homecoming in November. The award is given by the OBU Alumni Association in recognition of service and leadership. After being directed to the executive office, Dennis explained his unique situation to the president's secretary. She responded that the president, Dr. William Tanner, was a busy man and could not assist him in his plight. As Dennis turned to leave, he heard Tanner call to him. Having overheard the conversation, Tanner invited the young man into his office. Dennis again explained his troubled past and his present calling. When he finished, the two men sat in silence. Dennis said Tanner then exclaimed, "I believe you. Let's kneel down here and pray that God will give you the strength and ability to graduate, because I am about to get you enrolled!" Wanting to explore different ministerial vocations, Dennis decided to major in religion. He said he wanted to explore his new faith and stimulate his spiritual growth, but mostly, he had a strong desire to understand more about the Bible and his life purpose. Dennis enjoyed school, but he found he had to study and apply himself more than he ever had in his life. "I had never been pushed to discover my creative thinking skills along with my critical thinking skills," Dennis said. "It was incredibly difficult for me." By the time he started taking the well-known Western Civilization course, he was severely struggling academically. He began showing up late for class and missing class all together. One day, after skipping class, his literature professor, Dr. Laura Crouch, showed up at his door with an alarm clock in hand. She said she did not know if he was missing class due to a faulty alarm clock, but told him to put the new clock beside his bed, and when he looked at it, to remember her coming over that day. She said she thought he had a great, creative mind and potential, and she encouraged him to get a tutor, learn to study and not quit. He took her advice. Dennis enlisted the aid of two fellow classmates who patiently tutored him. "I learned how to learn," Dennis said. "I learned how to think. I learned my faith and my intellect are both only complete together." He not only read and pondered about what it meant to be in ministry, but he also applied what he learned to his life. Dennis became a volunteer "Big Brother" at Hope House Youth Services and was heavily involved at First Baptist Church of Shawnee. Due to his own troubled past, Dennis discovered he could relate well to the children in the youth services program. The trouble was not all of his own making, as Dennis' early childhood was filled with turmoil. Both parents were alcoholics. His father died when Dennis was still very young. His mother continued to drink heavily. Dennis and his sister were removed from their mother's custody by Oklahoma Child Protective Services and adopted by their aunt and uncle. The relatives gave him a second chance, which he acknowledges and appreciates to this day. "My gratitude for that second chance is what drives me to spend my life seeking that same second chance for all those I serve," Dennis said. After graduating from OBU in 1979 with a degree in religion, Dennis earned a master's degree in marriage and family counseling from Southwestern Baptist Theological Seminary. He received certification as a Licensed Professional Counselor, Licensed Marriage and Family Therapist and Licensed Childcare Administrator. Dennis serves as president and chief executive officer of Eckerd Youth Alternatives in Clearwater, Fla., one of the nation's leading non-profit providers of behavioral health, juvenile justice and child welfare services. He works with children and families in the foster care and juvenile justice systems and other private care families who struggle with difficult personal or family crises. Dennis and his wife, Becky, have five children including four boys and one girl, ranging in age from 10 to 21 years. 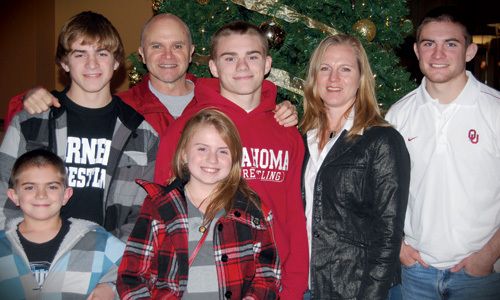 Their oldest son, Dillon, is a sophomore at the University of Oklahoma where he is on the Sooner wrestling team. His brother, Dalton, also a wrestler, plans to start at OU this fall. The younger boys, Dryden and Daxon, aspire to follow in their brothers' footsteps. Dabney, the only girl of the family, looks forward to being part of a collegiate swimming team. "Outside of my faith and relationship with Christ, my wife and children are my greatest joy, my greatest gift, my greatest teachers, my greatest inspiration, my greatest encouragement and my greatest supporters," Dennis said. His experiences as a child and his time at OBU molded him into who he would become as an adult. "Those days were the foundation of an adult life lived with much greater capacity, competence, confidence and conviction," Dennis said. "Without a doubt, OBU taught me to be a critical and creative thinker. Getting to be involved with students from all states in the U.S. and many different countries broadened my cultural awareness and appreciation for diversity. That was an immensely enriching experience as well as educational, encouraging and equipping toward an ease with all people I encounter and an expectation to find something enriching about everyone I meet." Dennis, who was given a second chance by Dr. Tanner about 36 years ago, now helps give second chances to others. "I have tried to make good on his investment and belief in me," he said. "I will never be able to repay him fully, and I will forever be grateful for that grace and belief he extended to me that day. "I love the fact that the slogan for Eckerd is, 'The First Name in Second Chances,'" Dennis said.